Perhaps there is no creature on earth more awe-inspiring for its sheer animal power and beauty than the Siberian Tiger. Reaching sizes over 700 pounds, it is the largest living cat in the world. Incomparably strong, yet quick, sensitive, stealthy and independent, individual Tigers have been known to stake out ranges of over 3000 square miles in far-eastern Siberia. 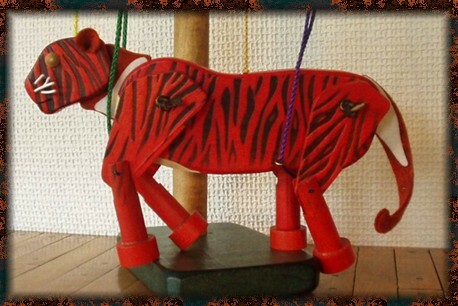 Rendered here in White-birch hardwood the Tiger's stripes are applied with wood-burning over a lustrous orange finish. An impressive sculpture when still, it becomes an exciting 'motion-sculpture' in the hands of any playful person.